We all know that a few weeks back, Samsung provided a schedule for the Android 9 Pie Updates together with the devices going to get that. According to that schedule, Android 9 Pie Update for Galaxy Note9 has to roll out in the coming weeks. 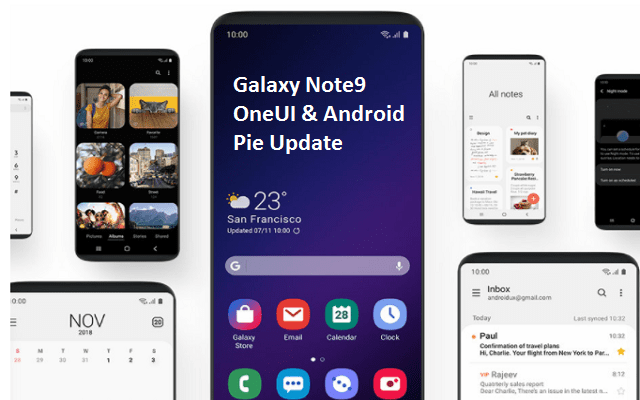 However, Samsung has started seeding the latest Android 9.0 Pie update along with its brand new custom One UI for the Galaxy Note9 weeks before the deadline. The update is rolling out to the users residing in Germany right now with the build number N960FXXU2CRLT. Furthermore, the OTA update comes with Google’s January security patch and hopefully it will step outside of Germany in the following days. The All-New Samsung’s OneUI provides a new and fresh experience to its users. In addition to that, Samsung has minimized the clutter so that the number of distractions in the software can be reduced. The interface is designed with the focus on the bottom half of the screen. Now everything including the app menus to pop-ups will appear at the bottom of the display. The users can enjoy a simpler and easy to handle UI and can use it single-handly. In addition to all this, the software brings an updated lock screen. The modified fonts, app icons, and new on-screen navigations buttons are simple now. Furthermore, it also has Dark Mode Support. Samsung’s OneUI is also updated With Lock Home Screen Layout Toggle. The Lock Home Screen Layout Option lets you avoid accidental moving or deletion of an icon on the home screen. Let’s see when will this update make its way to your handsets.